Sidgwick & Jackson, 1983-03-01. 3. Hardcover. Used:Good. 1999-12-18. New. Ships with Tracking Number! INTERNATIONAL WORLDWIDE Shipping available. Buy with confidence, excellent customer service! 1999-12-18. Good. Ships with Tracking Number! INTERNATIONAL WORLDWIDE Shipping available. May not contain Access Codes or Supplements. May be ex-library. Shipping & Handling by region. Buy with confidence, excellent customer service! Grove Press, 1954-01-01. 12th Printing. Paperback. Very Good. 2008-05-07. New. Ships with Tracking Number! INTERNATIONAL WORLDWIDE Shipping available. Buy with confidence, excellent customer service! 2003-07-01. New. Ships with Tracking Number! INTERNATIONAL WORLDWIDE Shipping available. Buy with confidence, excellent customer service! Sidgwick & Jackson, 2000-02-04. 3. Paperback. Used:Good. ACLS History E-Book Project. Hardcover. 1597400084 Special order direct from the distributor . New. 2000-03-07. New. Ships with Tracking Number! INTERNATIONAL WORLDWIDE Shipping available. Buy with confidence, excellent customer service! ACLS History E-Book Project, 2001-01-01. Hardcover. Used:Good. 2014-05-02. New. Ships with Tracking Number! INTERNATIONAL WORLDWIDE Shipping available. Buy with confidence, excellent customer service! ACLS History E-Book Project, 1999-12-18. Hardcover. Good. 2008-05-07. Good. Ships with Tracking Number! INTERNATIONAL WORLDWIDE Shipping available. May not contain Access Codes or Supplements. May be ex-library. Shipping & Handling by region. Buy with confidence, excellent customer service! 1974-10-28. Good. Ships with Tracking Number! INTERNATIONAL WORLDWIDE Shipping available. May not contain Access Codes or Supplements. May be ex-library. Shipping & Handling by region. Buy with confidence, excellent customer service! Taplinger Pub. Co.. PAPERBACK. B007SZY6D2 1981 Paperback - Moderate wear, including some creased page corners; No markings on inside pages ~ We Ship within 24 Hours + FREE Tracking, answer emails fast, accept returns & work hard to deliver 100% customer satisfaction! . Good. 2005-07-09. Good. Ships with Tracking Number! INTERNATIONAL WORLDWIDE Shipping available. May not contain Access Codes or Supplements. May be ex-library. Shipping & Handling by region. Buy with confidence, excellent customer service! ACLS Humanities E-Book. PAPERBACK. 159740599X Special order direct from the distributor . New. ACLS Humanities E-Book, 2008-08-01. Paperback. Used:Good. ACLS Humanities E-Book, 2008-08-01. Paperback. Good. Grove, 1959. Paperback. Very Good. No publication date given but suspect 1959; 17th printing. Slight wear; front cover curls. Sidgwick & Jackson Ltd, 1985. Volumes 1 and 2. This is an ex-library book and may have the usual library/used-book markings inside.This book has soft covers. In fair condition, suitable as a study copy. Sidgwick & Jackson, 1983-03. Hardcover. Good. Grove Press. PAPERBACK. 0394172159 New Condition. . New. Grove Press. PAPERBACK. 0394172159 Like New Condition. . Fine. 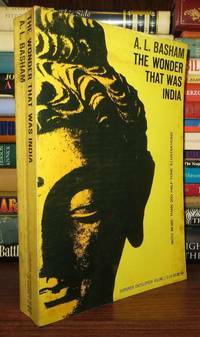 London: Sidgwick and Jackson, 1954 Interprets ancient Indian civilization to the ordinary western reader. From the collection of Wayne Prescott Suttles, renowned anthropologist, scholar, and linguist regarding many Pacific cultures, and especially the U.S. Pacific Northwest Coast Salish people. His stamp to the ffep. Provenance provided upon request. Condition notes: 568 numbered pp; HB. Pages: clean, ivory, tight, faded brick topstain, map eps, color frontis; front hinge cracked but intact, a.e. lt tanned. Cover: brick, gilt titles spine; modest shelfwear, extrems moderately worn, tiny tears head/tail, tail bumped, spine mildly sunned, front board wiggly. Sidgwick & Jackson, 1969. Hardcover. Very Good. Very good hardcover with dust jacket. Pages are clean and unmarked. Covers show minor shelf wear with minor rubbing. Binding is tight, hinges strong. Dust jacket shows good with rubbing, scuffing and small tears. Previous owner's name on inside cover; 100% Satisfaction Guaranteed! Ships same or next business day! 2000-03-07. Good. Ships with Tracking Number! INTERNATIONAL WORLDWIDE Shipping available. May not contain Access Codes or Supplements. May be ex-library. Shipping & Handling by region. Buy with confidence, excellent customer service! New York: Grove Evergreen, 1959. Trade paperback format; Evergreen encyclopedia volume 1; Front cover has a few specs of soil, spine has some reading creases, rear cover has soiling spots along the spine border; Tightly bound; Text and pages are clean and bright; No markings or writings; Over 200 Illustrations. First. Soft Cover. Very Good. Picador. PAPERBACK. 033043909X New Condition. . New. Grove Press. PAPERBACK. B0006D79KK New Condition. . New. Sidgwick & Jackson. PAPERBACK. 0283992573 New Condition. . New. Taplinger Publishing Co., 1968. This is the 1st American Edition, Third Revised Edition, c1968, Printed in Great Britain. This is a Very sturdy and square India History Hardback in Very Good++ condition with a Very Good++ jacket. It is in great condition both inside and out. The cloth cover is very bright and very clean. Very nice edges with just a touch of spine end wrinkle. The pages are tight & unmarked. small p/o name. The jacket with price is also bright and clean with just a little spine end wear. Very nice book. Heavy. 572 pages. #19182. 1st American Edition. Hardcover. Very Good++/Very Good++. Picador. PAPERBACK. 033043909X Like New Condition. . Fine. 2014-05-02. Good. Ships with Tracking Number! INTERNATIONAL WORLDWIDE Shipping available. May not contain Access Codes or Supplements. May be ex-library. Shipping & Handling by region. Buy with confidence, excellent customer service! Sidgwick & Jackson, Ltd.. Hardcover. B000SIQ7II William Clowes and Sons, Ltd; NY, 1954. Hardcover. First edition. Good only, discoloration front bottom gutter/light shelfwear, in a Good, price clipped/edgeworn/light chipping, Dustwrapper. 8vo[octavo or approx. 6 x 9 inches], 568pp., b&w photos and illustrations, maps on paste downs and fly, indexed. We pack securely and ship daily with delivery confirmation on every book. The picture on the listing page is of the actual book for sale. Additional Scan(s) are available for any item, please inquire. . Good. Sidgwick & Jackson. Hardcover. 0283354577 British third revised edition, fourth printing. Jacket is in Very Good + condition. Spine area of jacket is fadded. Small 1/8 inch spot back of jacket. Jacket is NOT price clipped. Covers are clean and bright. Edges are sharp. No tears or creases. The book itself is in Near Fine condition. The binding is straight and tight. NO remainder mark. All books are marked down 35% until February 1, 2019. Start stocking up now! . Very Good. Grove Press, 1959. (Evergreen Encyclopedia, No. 1) Very large, very heavy softcover, more than 200 half-tone photos and illustrations plus numerous line drawings and maps. (8th ptg.) Light owner stamp on long pages' edge, very slight wear to all four spine edges, creased near bottom back left. Good. . Soft Cover. Good. Sidgwick & Jackson, London, 1954. 568 pp including index, map on end-papers, coloured and b&w plates, line drawings, maps, previous owner's name stamped on front end-paper, previous owner's details on half-title, frontispiece taped, small clean tears to top edge of d/j, else very good copy in like, pictorial, price-clipped d/j. Grove Press. Used - Good. Good condition. Sidgwick & Jackson. PAPERBACK. 0283992573 Like New Condition. . Fine. Grove Press. PAPERBACK. B0006D79KK Like New Condition. . Fine. New York: Grove Press. 1959. First Edition Thus; Fourth Printing. Softcover. Good- in wrappers. Foxing and discoloration. Crease at spine. Some pencil underlining to text. Hinge is starting. ; 8vo 8" - 9" tall; All domestic orders shipped protected in a Box. .
2017. .. Brand New. Orders usually ship within 1-2 business days. We use FAST SHIPPING via FEDEX/UPS/DHL and deliver within 3-5 business days with tracking number, no shipping to PO BOX, APO, FPO addresses. Kindly provide phone number for expedite delivery. 100% Customer satisfaction guaranteed!